MEXICO CITY (CNS) — A Jesuit priest denounced a raid on his parish and human rights center, calling it yet another attempt to intimidate activists who have been critical of Mexican government excesses in the crackdown on organized crime. 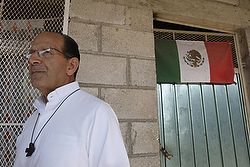 Jesuit Father Jose Castilla Plasencia, pastor of the St. Jude Thaddeus Parish and director of the Juan Gerardi Human Rights Center in the northern city of Torreon, spoke after a Feb. 9 raid, which he said was conducted without a warrant and prompted by an anonymous tip alleging drugs were in the installations. The raid, he added, included the search of crypts. “This interruption by federal and state forces and the army shows, in a clear way, the current security policy, which, far from resolving problems, increases the vulnerability of the population that is subject to this kind of abuse,” Father Castilla said in comments published by the Monterrey newspaper El Norte. “The acts constitute a clear aggression and try to send an intimidating message against defenders of human rights,” he said. Individuals working on human rights issues — including Catholic priests who protect undocumented migrants — have been subject to police and army raids, along with attacks from assailants in cases that largely go unsolved. Over the past four years, parish and diocesan human rights centers in Ciudad Juarez, Saltillo and Torreon have been either raided or robbed. Priests, including Father Alejandro Solalinde in Oaxaca state and Franciscan Father Tomas Gonzalez Castillo in Tabasco state, have been accused of abandonment and human trafficking respectively during their work with undocumented migrants. Additionally, activists such as Norma Andrade, who founded the group May Our Daughters Return Home to protest the lack of progress in the unsolved murders of so many young women in Ciudad Juarez, have come under attack. Andrade, whose daughter was murdered in 2001, was slashed Feb. 3 in Mexico City, where she moved after being shot just two months earlier in Ciudad Juarez. “Evidently, it’s inconvenient for (the authorities) that there are organizations that are continually signaling the abuses they commit,” said Father Oscar Enriquez, director of the Paso del Norte Human Rights Center in Ciudad Juarez, which was raided by the federal police in June 2010. Federal and state officials have not commented on the raid in Torreon, although the Interior Ministry said in Feb. 7 statement that human rights were “the highest priority” of the federal government.